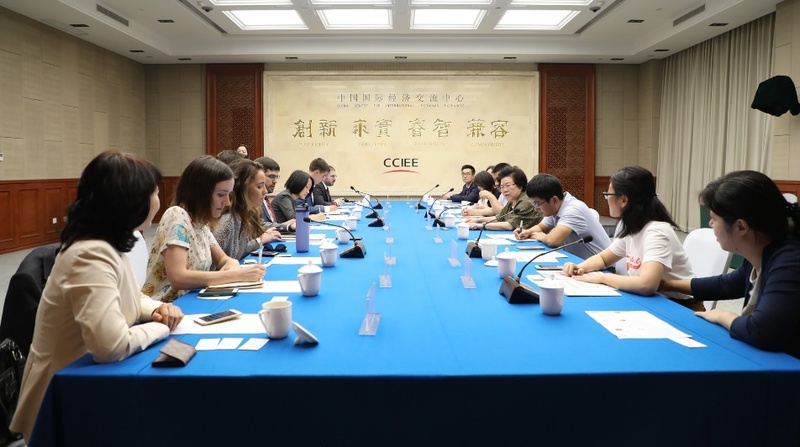 On the morning of September 10, a US journalists delegation from the Better Hong Kong Foundation visited CCIEE. Chen Wenling, Chief Economist of CCIE and other members of the China-US research team, Xu Changchun, Zhang Monan, Yan Shaojun, Zhao Chunzhe, Tian Dong and Mei Guanqun shared their views with the US reporters on China’s economy and the China-US economic and trade relations. Representatives from the following US media participated in the seminar, Bloomberg News, Barron’s, KLTV, Politico, the Huffington Post, and NBC. CCIEE Chief Economist Chen Wenling believes that the escalation of the trade war will have an impact on the US business and the economy. The U.S. government has started trade wars with many countries, which has not only undermined its creditability, but also harmed the interests of the United States. She hopes that China and the United States will form a healthy competition and win-win cooperation in the future. Researcher Xu Changchun said that the economic and political relationships between China and the US have become more inter-dependent since they established diplomatic relations many years ago. The media should contribute to the well-being of the Chinese and American people and the sustainable development of our society as a whole. During the seminar, the members of the US research project team answered questions raised by the American reporters.